The Broncos’ offensive line is no longer the doormat it has been for the past several seasons. 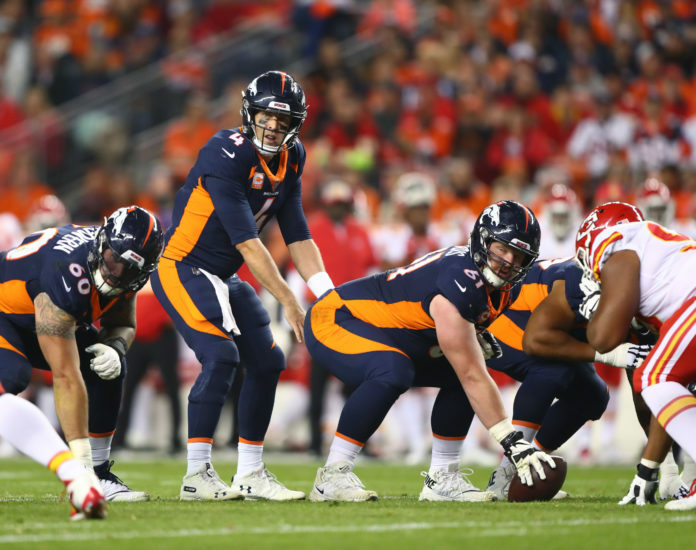 In 2018, the unit showed while it still has a long way to go, they will no longer be one of the Broncos’ numerous liabilities on the offensive side of the ball. That line stepped up in protecting quarterback Case Keenum and punishing opponents in the run game, which was one of the best in the NFL. Left tackle Garrett Bolles and right guard Connor McGovern are the biggest reasons for the offensive line’s turnaround. McGovern added stability to the right side of the line before center Matt Paradis suffered a fractured right fibula in Week 9 against Houston. Bolles started to flash the potential that made him a top-20 draft pick in the second half of the season. Bolles, McGovern and left guard Ronald Leary all appear to be locked in at their respective positions, but the same can not be said for Paradis or right tackle Jared Veldheer, who both are set to become unrestricted free agents this offseason. Without a doubt, the Broncos’ top priority this offseason should be to retain Matt Paradis. Paradis has been the nucleus of this Broncos’ offensive line since he entered the starting lineup in 2015. Last year, Denver’s offense went from averaging 377.1 yards and 22.8 points per game with Paradis in the lineup to 315.4 yards and 17.7 points per game after his injury. Veldheer, on the other hand, is much more expendable. Veldheer was purely pedestrian throughout the season and shouldn’t be getting any better considering the fact that he will be 32 by the start of next season. If the Broncos do decide to let Veldheer walk, who could be his replacement? The tackle group ready to hit the open market in a few weeks is a weak one the Broncos would be wise to steer clear of. There are very few players available that should raise John Elway‘s eyebrows, as the best options available are young tackles that didn’t work in their first stop. Three are Cincinnati’s Jake Fisher and Cedric Ogbuehi as well as Miami’s Ja’Wuan James. Though, because the free agent tackle class is so shallow this year, all of those players will go for way more than they’re worth. There is no better example of this than Chargers left tackle Russell Okung signing a five-year deal worth more than $13 million annually after a bad season in Denver. 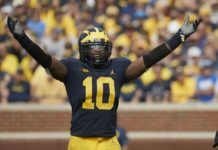 Ogbuehi, Fisher and James likely won’t sign a contract that ridiculous, but even if they could get them for cheap, the Broncos would be wise to shift their focus towards the draft. 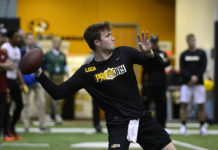 There has been plenty of hemming and hawing this year about the 2019 draft being weaker than most and much weaker than the star-loaded 2020 draft, and for good reason. But, there is one area where the 2019 draft is actually stronger than most; in the trenches. The 2019 draft class is stacked along both the offensive and defensive lines, and the Broncos should take advantage of that early in the selection process. This year’s top offensive lineman Jonah Williams could be available for the Broncos at No. 10, but they could pass on him because he projects better as a guard than a tackle, even though he played outside at Alabama. Instead, Washington State’s Andre Dillard makes much more sense. Dillard is coming off a dominant Senior Bowl performance which solidified him as the best tackle in this year’s draft. Dillard is fantastic in pass protection and, although his run blocking could use some work, should be a high-end tackle at the next level. Dillard is naturally a left tackle, which may sound like a negative considering the Broncos need a right tackle, but it is actually a positive. Playing Dillard at left tackle would allow Bolles to move to his more natural position of right tackle, which could help expedite his development. The greatest concern surrounding Dillard is that, “He isn’t a bully and there isn’t much dog to him” but the Broncos already have their bully in Bolles and don’t necessarily need a second. The Broncos should take a tackle in the first two rounds of the draft, and with the move, solidify their offensive line for years to come. Andre Dillard would be a slam dunk first-round pick who might not get the fans excited but would keep Keenum and whoever else is under center for the Broncos past 2019 clean in the pocket. 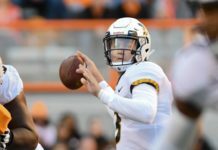 If the Broncos opt to take a quarterback in the first round, though, which seems almost certain, there are still plenty of tackles for the Broncos to target in the second or third round. Wisconsin’s David Edwards would be a fantastic option for Denver in the middle rounds and would be a plug-and-play, Day One starter at right tackle. Florida’s Jawaan Taylor, Oklahoma’s Cody Ford and West Virginia’s Yodny Cajuste are all names Broncos fans should keep an eye on. Even Colorado-born Dalton Risner out of Kansas State could be in play later on in the draft as an interesting prospect as well. By re-signing Paradis and then finding a stud at right tackle, the Broncos would be setting themselves up with the best offensive line in quite some time. Add in the coaching of Mike Munchak, and Denver’s front five could skyrocket to one of the best in the league.